"I'm happiest when I'm running. And I'm most miserable when I can't run because of a cold or injury. When I can run I feel great." Eric Wainaina is speaking in Japanese, and obviously enjoying life. He ran the marathon for Kenya at the 1996 Atlanta Olympics, and at the next Olympic Games in Sydney, in 2000. He won the bronze, then the silverhe's one of the best marathon runners in the world. He works for the Japanese camera manufacturer, Konica, in the corporation's General Affairs Department. He's also a member of Konica's track and field team. "I think of myself as being almost Japanese." Eric (28) was born in the city of Nyahururu, Kenya, and came to Japan in 1993, when he was 19. 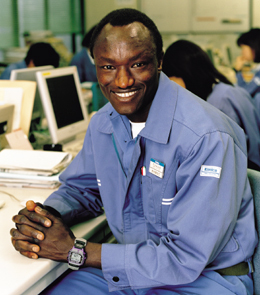 He was a track and field athlete at his high school in Kenya, and caught the attention of Konica's club. That led to a trip to Japan. 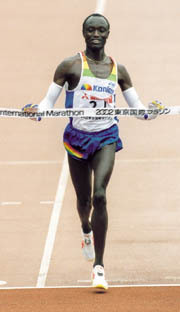 "Kenyans are not really interested in the marathon. I wasn't either, so when people would praise me for running fast I didn't think much of it. But I knew another runner from Kenya, a little older than me, who made a name for himself in Japanso I thought, if I can get to Japan, maybe I can do well as a runner there, too." At the time, Eric knew next to nothing about Japan. "The movies and TV programs I watched showed the Japan of the samurai. I thought everyone lived in old wooden houses, and that the men shaved off most of the hair on the top of their head and tied the rest in a topknot!" "Almost as soon as I got to Japan, I was sent to a training camp in Chiba Prefecture. When they served sashimi at the lodge we were staying in, I was really surprisedI'd never eaten raw fish before, and when I saw everyone wearing informal kimono called yukata, I thought, 'I guess I'm in the land of the samurai after all!'" He grins. It didn't take long before he was used to the different culture. The next year, he won the marathon in Hokkaido, northern Japan. The company's track and field team immediately saw his potential. He's so fond of Japanese food, especially udon noodles and miso soup, that he took some with him from Japan to the Olympic Games. "I like Japan a lot. For one thing, people here respect each other. Yes, sure, they get angry sometimes, but basically they like people and are good to them. For example, even if I don't buy anything in a store, they'll probably say, 'Thank you for coming.' That would never happen in Kenya. Whatever Japanese people do, they try to do it as well as they can. Japan's the best place for me!" He lives a bachelor life in Konica's dormitory in Hachioji, Tokyo. At six in the morning, he goes jogging for about an hour. After that, he's off to work. The office where he works administers various aspects of company operations, including the management of salary payments for all company employees. By three o'clock, he's running again, training at a track operated by the metropolitan government. During his time off, there's a good chance he's giving tips in marathon running at a nearby elementary or junior high school. At the company they have an affectionate name for himWai-san. At the track, people from the neighborhood call out, "When's your next marathon?" After he came back from the Olympics with his medals, he says that so many people shook his hand, his shoulder hurt. Eric is a hero in his adopted city, Hachioji. "The most important thing is to enjoy each moment. While you're running a marathon you can get really tired, but if you stay in a good mood you'll get through it OK. You can keep doing anything if you can convince yourself that it's fun." Eric says his favorite Japanese word is akiramenai, which means "never give up." His next aims are to win Olympic gold, and to take a course to polish up his Japanese. Relaxing in his company dormitory. Wainaina works for a camera manufacturer, so it's not surprising his hobby is taking pictures.